After their home burns down, fourteen-year-old Nick, his younger brother, and their father move into a ramshackle Victorian house they've inherited. When Nick opens the door to his attic room, he's hit in the head by a toaster. That's just the beginning of his weird experiences with the old junk stored up there. After getting rid of the odd antiques in a garage sale, Nick befriends some local kids - Mitch, Caitlin, and Vincent - and they discover that all of the objects have extraordinary properties. What's more, Nick figures out that the attic is a strange magnetic vortex, which attracts all sorts of trouble. It's as if the attic itself has an intelligence…and a purpose. Ultimately Nick learns that the genius Nikola Tesla placed the items-his last inventions-in the attic as part of a larger plan that he mathematically predicted. Nick and his new friends must retrieve everything that was sold at the garage sale and keep it safe. But the task is fraught with peril-in addition to the dangers inherent in Tesla's mysterious and powerful creations, a secret society of physicists, the Accelerati, is determined to stop Nick and alter destiny to achieve its own devious ends. It's a lot for a guy to handle, especially when he'd much rather fly under the radar as the new kid in town. Fans of intrigue, action, humor, and nonstop surprises are guaranteed a read unlike any other in Tesla's Attic, Book One of the Accelerati Trilogy. 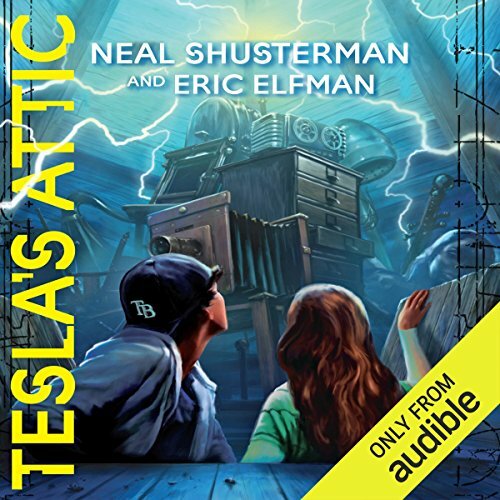 ©2014 Neal Shusterman and Eric Elfman (P)2014 Audible, Inc.
Would you listen to Tesla's Attic again? Why? Yes! I started reading YA to my son when homeschooling and even though he is an adult now, I keep coming back. Good clean fun! the story was very good and I'm annoyed that the others in the series don't seem to have audio books. I do have to say that the narrator was a bit slow. I actually turned the speed up to 1.1x to get it to seem normal. the voices of the narrator we're good, just that the pacing armed off. other than that, a great read. This was a fun YA for me. I like YA's quite a bit. The performance was stellar with very good distinctions on different voices. I particularly like Mrs. Plank's voice as she sounded a bit like Roz from Monsters Inc. The story itself was entertaining although there were a few MarySue moments for me where characters did things so dumb, I yelled at them while listening to the book. Just actions that no sane teenager would do in today's society. But I think I will listen to book two when it comes out. I'd like to see what the kids are up to next. The kids in this book are far more mature than some adults in other books I've read. I really like that. The less teenage angst in a story, the better in my opinion. Especially when it comes to YA books. The story is pretty straight forward. There is a tragedy in the past, that breaks the main character. He meets another broken character and together they become whole. Along the way they find a bunch of stuff that belongs to Tesla. Leading to mystery and intrigue. What I really liked about this book is how it deals with the many types of human pain. It's very smart and honest about, loss, loneliness, depression, being excluded and the desire to be accepted and to fit in. It's a well written and tight story with excellent narration. I will definitely be getting the sequel. Yes, the series is well written and the story is fun and compelling. It interlaces some historical facts in with it's own science fiction-y sensibilities for an enjoyable read/listen. What was one of the most memorable moments of Tesla's Attic? The premise. That a mad genius decades ago left some wondrous (and somewhat dangerous) inventions in an attic that fall into the hands of an average teenager. Which character – as performed by Vikas Adam – was your favorite? Nick, the main protagonist. He is well drawn out with an emotional backstory. His characterization seems quiet good. Yes, the story and performance were both very engaging. I would place this at about the same level as the Rick Riordan books. If those are in your "like" pile, these will probably be as well. One issue I had was that Audible only has the first book of the trilogy available. As far as I can tell, the follow up volumes are strictly read only. I didn't think I would - but I loved this story! What a great story! Definitely would listen to others in this series! Some of the characters could use some polishing and fine tuning, but this is only book one. Looking forward to the rest of the series to see what other trouble these kids can get into! If you want the perfect book to start on Audible, this is it! Excellent story, amazing narration and flawless performance. I can't wait to listen to the next book in the series because the cliff hanger demands it. I will recommend this to all my scifi students and conspiracy theorists. They will love it!! Thanks Audible!! The whole family really enjoyed this on our road trip! Great narration also- perfect voices. This Read is realley enjoyed by my family. I read it over and over again.